Everybody knows an old saying “do not pretend to be king when you are a beggar”. Apparently, Scott Pruitt forgot about his grandmother’s advice and now the airs of grandeur are taking its toll that, besides the excessive account that has been spent in the Environmental Protection Agency (EPA), not even Jeff Bezzos could help him. 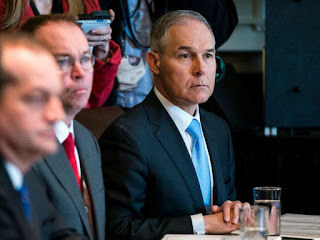 What began as a simple common rain has turned into a storm for the EPA manager Scott Pruitt, who seemed to be very concerned about his personal safety and now will have to explain what he did with the money of the taxpayers. In the reports and complaints made is Pruitt’s excessive safety equipment (about twenty) that exceeded the overtime budget and on several occasions separated agents of investigations on environmental crimes. According to reports, several million dollars were spent on the Administrator's full-time personal security team. Several analysts and experts point out that said spending is three times higher than the part-time security quota of its predecessor. The bad news for Scottie comes just when, in addition to his excessive expenses in security, there are also those related to travel expenses and ethical errors that have put him in the center of the spotlight. Among the management misuses of the public funds made by Pruitt, there is the rental of a condominium related to a lobbyist in the energy sector, and a broadly favorable treatment for its employees, facts that undoubtedly lead to ethical conflicts and corruption. The Washington Post also reported that among the mistakes made by the EPA Administrator is having increased the salary of a public employee without the consent of the White House. Although it has not been publicly stated, Scott’s image is much deteriorated. There is not only his lack of authority and conscience at allowing the president of the United States to come out of a beneficial agreement for the improvement of environmental health globally but also are now these ethical and moral conflicts. Nobody knows Trump’s decision to get out of the Paris Agreement responded to and advice from Pruitt who has largely demonstrated his interest in favoring the tycoons of the oil and gas industry. So much so that Pruitt favored the expansion of an Enbridge pipeline, coincidentally a Canadian firm related to the owner of the condominium in which Scott resided. And although Scott has not put on the suit of corruption, he surely wore the incompetence one because, besides living in a condominium whose rental was well below of the area’s usual costs, it was very difficult that his advisors would not have reported he was accepting favors from an energy lobbyist by residing in one of his properties. However, despite the flood, Donald Trump has launched his lifeguard to try to rescue from critics his fellow Scott Pruitt. Trump has repeatedly expressed his support to the Administrator of the EPA, a total contradiction since the president has reiterated on multiple occasions his interest in cleaning up the quagmire in which the White House has become and choosing the “best of the best”. Trump has evidently never clarified the term so it’s supposed he is talking about himself and his interests since he dismisses those who contradict his bad decisions and stays with those who show faithful dog loyalty. On the other hand, Sarah Sanders Huckabee said the White House is "examining the matter" of Pruitt. Unquestionably, Trump’s cabinet will be remembered as the most corrupt and incompetent in the history of the United States of America.